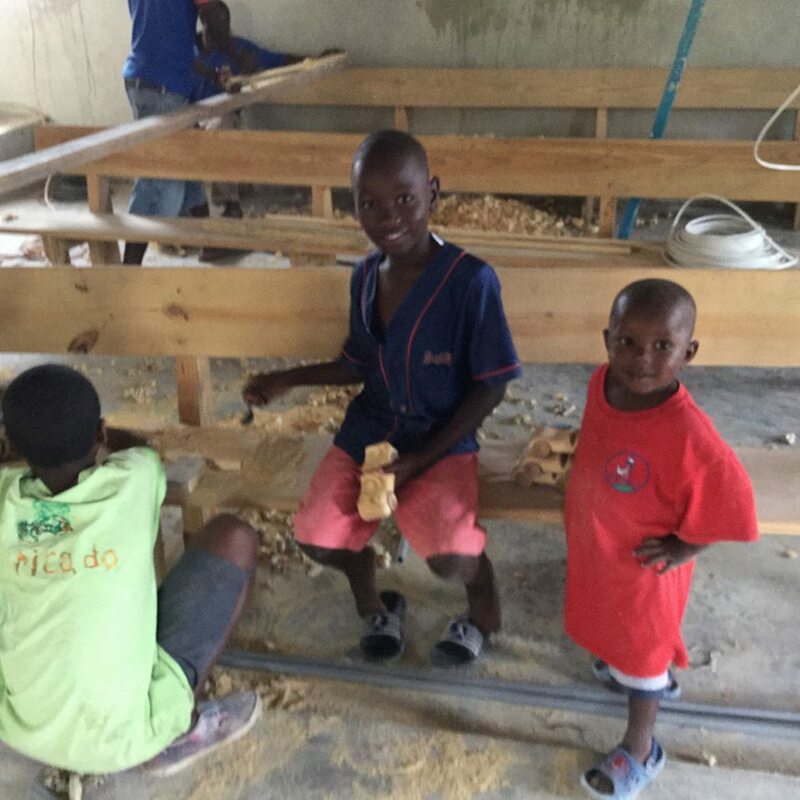 The goal of Haiti Care Mission is to share the love of Jesus with the children of Haiti through handmade items. Each hand sown item is made to help every child know that they are precious in His sight. Pinless cloth diapers, pillowcase dresses, and sleeping mats are used as a means of sharing the Gospel of Jesus with the children and families of Haiti. They say a picture is worth a thousand words, so this month we are sharing more pictures from Pastor Lance’s trip to Guatemala. For the wonderful sewing ladies, we know you will be able to identify some of these gifts. We hope it is an encouragement for you to see your “works of love” in the hands of these precious people. It is our great privilege to be able to partner with sewing people, financial partners and churches to deliver these gifts with the love of Christ. This month, we began planning our November trip to Haiti. Next month, we will share more about those plans. In the meantime, if you are living up north and love to shop, keep your eyes open for clearance deals on boys shorts. (We had one lady who found them for 25 cents each. That was incredible.) We are always in need of more items for the boys and shorts are a great gift for them. God is continuing to open doors for Haiti Care Mission. Just today we received a call from another organization that serves Haiti and we are excited about how we may be able to serve together in the future. Thank you for praying and thank you for your gifts. We are honored to partner with you. · Praise God for His direction and wisdom. · Praise the Lord for awesome partners in prayer and support. · Praise God for His provision for our family. · Please pray for all of the children of Haiti that will start school this month. · Pray for more child sponsorship partners so more children can attend school. · Please pray for Haiti Care Mission as we start planning the next season of trips. Pray for God’s direction for every detail. 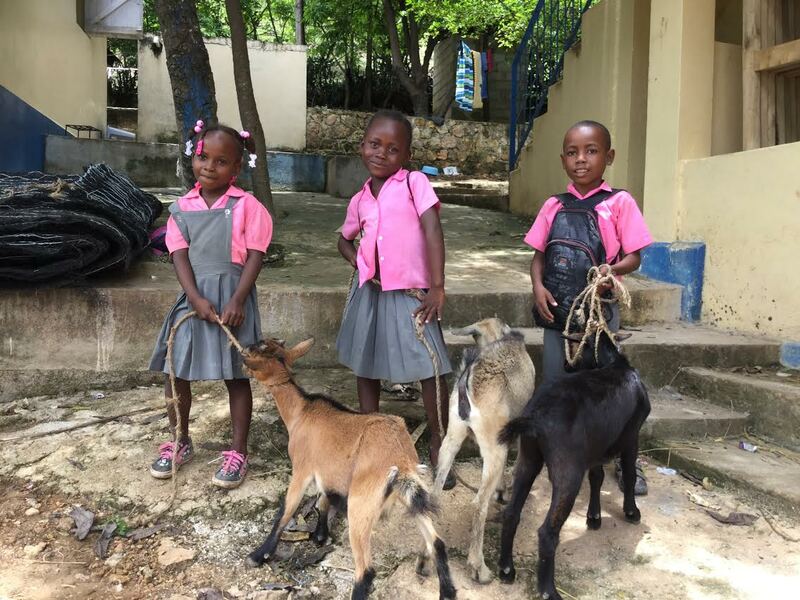 This month, we received the pictures and confirmation of the distribution of dozens of goats to the children of Haiti. Due to the efforts of Haiti Care Mission supporters over the past two months, more than 35 goats have been given away. The children are always very grateful to receive the animal and they take great pride in taking the goat home. These goats will provide income for the family and help the children learn responsibility as well as animal care. Thank you to all of you who helped with this project. We had many people jump on board for this opportunity and there is much more to come. One church, Clear Lake Evangelical Free Church, really took the challenge to heart and is providing the funds for 63 goats. What started as a Sunday School project with the kids turned into a church wide effort. It is amazing how something can start small and end up blessing 63 children and families. Many thanks for believing in this project. In addition to goats, many dresses and shorts were distributed this month. The clothing went to the children of Guatemala. A friend of ours was traveling to the country on a short term trip and we were able to help fill her luggage with items to give away. During her trip, she did children’s ministry and was able to bless many children. We are always grateful for opportunities to bless children of any nation with the gifts from Haiti Care supporters and sewing groups. Thank you for working hard to create these gifts and for your hours of labor to make others smile. You are helping share the love of Jesus with the children of the world. During June, we will be taking a short vacation and time of rest. And in July, Lance will be traveling to Guatemala with a youth team from our church. They will be taking hundreds of items along to share with the children. Because of the busy summer schedule, our next newsletter will be in August and we look forward telling you all about what God is doing through Haiti Care Mission. Thank you for your faithful support and prayers. · Praise God for new opportunities to take the Gospel and the love of Jesus to other nations. · Praise the Lord for an abundant supply of items for future trips. He is keeping the shelves full and ready to give. · Praise God hard working sewing groups that share their talents and love with many children. · Please pray for the people of Haiti. Pray for protection from the storm season. · Please pray us as we travel this month and Lance travels to Guatemala next month. · Pray for us for guidance and direction for Haiti Care. We are happy to be home but yet our hearts are still in Haiti. Our spring trip was a very successful one. We had great opportunities for ministry and precious times of building relationships. Our trip started with a two day trip out to the schools in Arnoux and Dufour. These villages are in the south and are a long hard drive. We started our time with students with a time of teaching with the students from preschool to grade 6. They had just completed their lesson series on healing so I was able to share with them my healing testimony of how God healed me. It was fun to watch their faces as they listened to a real life story of God’s healing. After our time of teaching, we were able to bless every student with gifts of love. Cars, backpacks, dresses, shorts, flip flops and toiletries were very well received by the students. Most of the students put their new clothes on over their school uniforms at the end of their school day. It was fun to see many of them at the market later that day wearing their new gifts. The remainder of the trip, we worked at headquarters. I helped with the production of booklets for chapel. The kids in Haiti do not have their own Bibles so these booklets they receive in the chapel program become their Bibles. It seems like a trivial task to staple and fold but the impact on the children's lives is great. Lance was able to use his tiling experience to help the missionaries as well. He worked on fixing up one of the bedrooms which is used for short term teams. 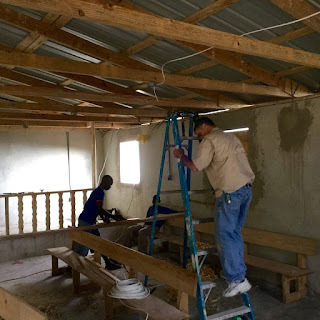 Later this month, Lance will return to Haiti to tile another room and/or do wiring for a new church. We feel blessed to be able to use the talents to help our dear friends. The trip also included a very exciting day for Grace and Hope. Even though there was no school due to state testing, our sponsor children and their siblings came to the school for the day to hang out and play. They ran, jumped, played ball, and laughed for hours. The memories they made will be forever in our hearts. It was a very special treat for all of us. Thank you for all of your prayers and gifts of love for this trip. We are grateful for your support and encouragement. Just a few short weeks after we returned from our last trip, Lance went back to Haiti. During this second trip, he spent four days in country helping with the completion of a new church building. The church had been previously built and just needed to have some finishing touches. Lance was able to help them so they can have their dedication service this month. During his time at the church site, Lance and Pastor Tom ran all of the wiring and installed all of the electrical fixtures to the new church, the old church and Pastor Canceus’ house. In addition, they brought the church a new generator. That means this will be the first time they have electricity at the church site. It is amazing to think that there are places in the world that have never experienced a church with electricity but this was the case for this church. It is sometimes hard to imagine all of the things we take for granted but others have never experienced. Nonetheless, it was a privilege to help them to finish their new church home with all perks of electricity. This project once again reminded us of all of the talents the Lord has taken from our past and is using for His glory now. Lance learned electric work many years back for his own home building project. He was blessed back then to work beside a journeyman who trained and mentored him as a favor to us. Now, God is taking that skill and using it to expand His kingdom. We are constantly amazed at how God shows us how He has been leading and training us for years for the work He has planned for us today. We are thankful for these reminders of His perfect plans for us. Thank you to all helped through your financial gifts to make this trip possible. Many Haitian people will be blessed because of your support. Se pou Bondye beni ou. It is hard to believe it is time for our spring trip to Haiti. We are looking forward to getting back on the ground and sharing the love of Jesus with the children and precious people of the country we love. We will be leaving next week for a 6 day trip. The first few days will be out in the countryside meeting with the children at 2 schools. We are blessed to have an abundant supply of items to take in for distributions. We are so grateful to all who have been sewing throughout the year and keeping our shelves full. The remainder of the days we will work at the headquarters of our partner missionaries. We will serve alongside them doing office work, odd jobs and cutting down the “to do” list so they can focus on ministry. We are also planning on helping with the distribution of several goats. Thanks to many of you, several children in Haiti will be taking a goat home from school in the next week. Pastor Noel in Arnoux has a goal for every student in his school to own a goat. The goats are an excellent way for the children to learn responsibility and contribute to the family income. This program is not part of Haiti Care Mission, but we are very happy to support it and bring it to your attention. 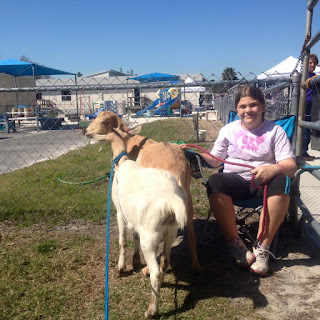 If you are interested in purchasing a goat for a child in Haiti, we would love to help you. The goats cost $35 each. Last week, we had the privilege of introducing this program to the families at Venice Christian school. 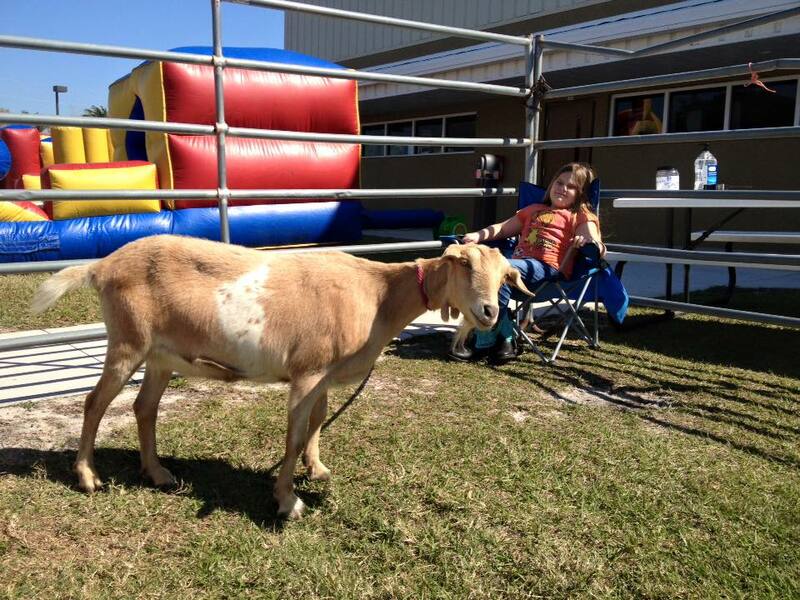 During the next month, the children at VCS will collect “Coins from kids for kids” to sponsor goats. 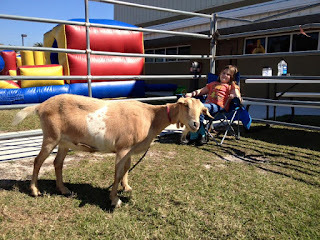 At Fun Fest this weekend, we set up a display with live goats and the school principal even offered to kiss a goat for every $20 donation. Thanks to his adventurous antics, there will be many new goat owners next week. Please keep us in prayer over the next month. With the large array of things happening in the ministry, we need wisdom, direction and favor. · Praise the Lord for partners who faithfully give to this ministry. 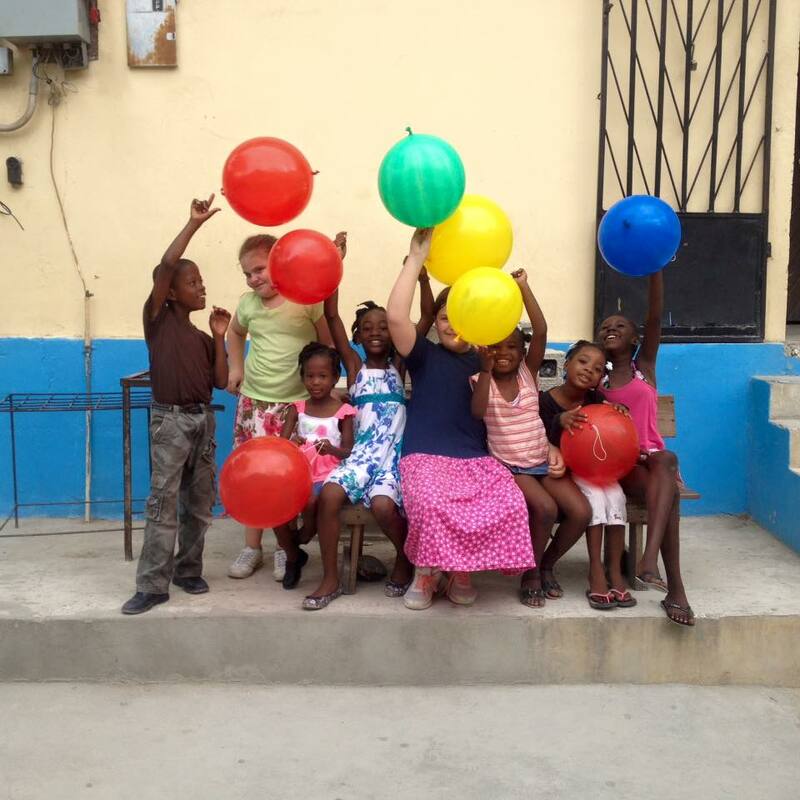 · Praise God for allowing us the opportunity to share Haiti Care with 2 churches this month. 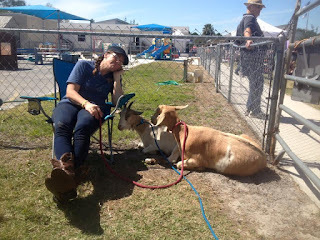 · Praise God for friends who helped us acquire goats and all of the equipment to have the goat display. · Please pray for traveling mercies, good health and favor as we travel to Haiti this month. · Please pray for God’s wisdom and discernment as we travel during heated political season. · Please pray for us to have wisdom as we pack and prepare for the trip. · Please pray for God’s connections and relationships to bring increase to Haiti Care Mission. Thank you for all of our faithful prayer warriors. We appreciate every prayer. Thanks to our friends at Bit of Hope Ranch for providing the goats. It was a very fun day at the school. It was a long day. We needed a nap. 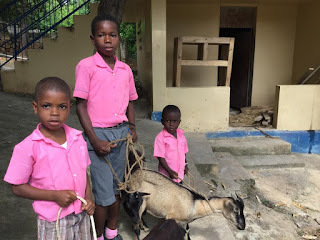 Kids in Haiti getting their goats on a previous trip. To make donations online: Click here & find Haiti Care Mission in Member Ministry area. For more information on how to get involved with the projects of Haiti Care Mission, please send email requests to haiticaremission@gmail.com. Thank you.